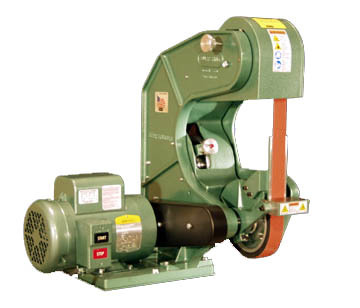 Model 760 is the largest example of our versatile three wheel belt grinders. Model 760 offers contact, backup platen, worktable and loose belt grinding at 8000 SFPM. -Rotating parts covered eliminating parts entanglement, greater operator safety. -Deeper horizontal and vertical throat clearance for larger and odd shaped parts. -New and improved door latching system. -New pinch point guarding when back up platen is removed. -New urethane covered idler wheels for longer life. -New idler wheels are electrostatically conductive.